Summer is a great time to get family and friends together for a backyard cookout. Whether you’re serving up hotdogs or a steak that’s been seasoned to perfection, it’s important to remember that you are cooking with an open flame. Follow these six grilling safety tips to keep your evening safe and fun. If you haven’t used your propane grill for a while or think you smell gas, check for leaks before attempting to light it. All you need is a spray bottle filled with water and a dab of dish soap. With the gas valve open, spray all the connections and the line that leads into the grill. If there is a leak the gas will cause the liquid to bubble. Be sure to repair any leaks you find before attempting to light the grill. These two grilling safety tips will keep you from being burned when you light your grill. First, never attempt to light a gas grill when the lid is closed. Gas can build up inside your grill and cause a fireball. Second, if for any reason your grill has gone out or you are having a difficult time lighting your grill turn off the gas and wait before trying again. This will give any leftover gas time to escape so it will not light unexpectedly. Burning off excess grease or dropped food might seem like a good idea but it could lead to a dangerous fire. Even a small grease fire can be dangerous and cause injuries. Cleaning your grill after every use will keep an unsafe amount of grease from building up. While you may think your grill’s lid keeps the fire contained, it’s important to keep it away from potentially flammable items. Always grill at least 10 feet away from your home and anything attached to your home. You should also watch for overhanging tree branches or other objects above your grill that could catch fire. Cooking with charcoal can be an exercise in patience but don’t let being in a rush keep you from observing this grilling safety tip. Attempting to remove hot coals from a grill can result in injury or fire. Just because a coal looks cool doesn’t mean it is. Test the coals by holding your hand near them to make sure they are safe to get rid of. Always dispose of coals in a metal container as an extra precaution against garbage fires. 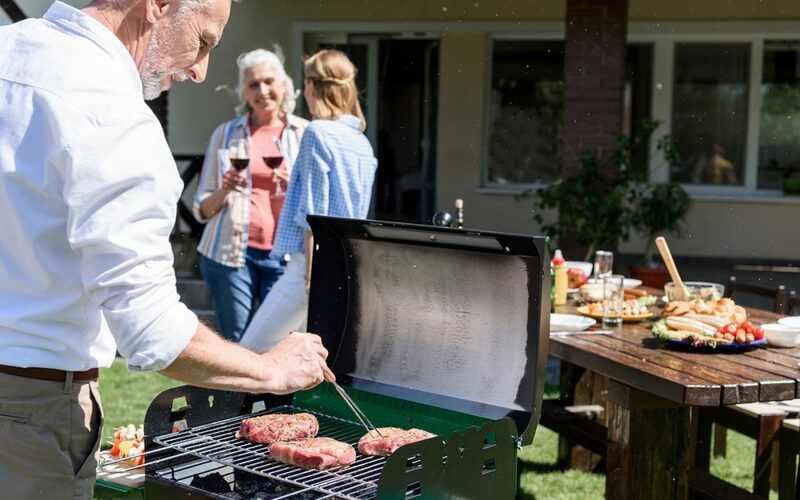 The last of our grilling safety tips may seem like a no-brainer, but it might make the difference between a relaxing afternoon and a catastrophe. Keep children and pets at least three feet away from the grill when it is lit and make sure any playing or running around happens far from your grilling area. Kelleher Home Inspections serves Las Vegas and the surrounding area with home and commercial property inspection services. Contact us to schedule an appointment.